of catastrophies and violence, of attempts of assimilation and syncretism, but also of the survival of the identity of the Macedonian people, of the prevedic culture mythology and a cult of the sun and the cosmos ( space, universe) of the prehistoric Macedonian phonetic alphabet and the prehistoric Macedonian language, of the existence of prehistoric Macedonian laws and prehistoric Macedonian state. Homer in the "Iliad" mentions Macedonian tribes (Payonian, Pelazgian, Venets or Enets, Brygian or , Phrygian etc.) that fight on the side of the Trojans against the allies of the new coming conquerors of the Balkans - Danaians, i.e. in the "Iliad" is portrayed a happening that occurred in 1193 - 1183 B.C. that is according to the famous alexandrian scientist Eratosten (III century B.C.) the happening which in the epic is portrayed on 15.693 should be treated in fact as the WW I between the so called pre Slav population of the Balkan - Anadolian cultural complex and the allies of the new incoming conquerors on the Pelopones (Morea) and Atica - the Danaians. Beside this, it is also known that in the IV century B.C. 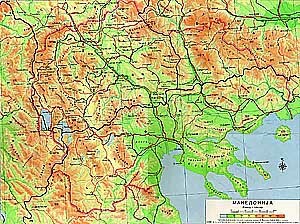 the Macedonians succeeded to create a Macedonian kingdom or Macedonian empire on a territory of about 3.8 mil km2, (map2) and later in the epoch Macedonian period in the shape of 4 kingdoms with their Macedonian dynasties continued to spread Macedonian culture and to breed the spirit of creativity and bringing the peoples, cultures and regions of the world together. Macedonians were and remain an authentic people on the Balkan peninsula while others came and went as guests or conquerors. Probably it is the reason why Herodot (484 - 424 B.C.) mentions: "Macedonian", "Macedonians", "Macedonia", "Upper Macedonia", "Lower Macedonia", "Macedonian mountains", "Macedonian roads" etc. In the "Holy Scriptures" she is mentioned as a biblical country, biblical people, Macedonia and Macedonians.